Discovering new cafés, local brunch spots, and restaurants is a national pastime for Australians, and smartphones are their go-to sources for ideas and information. Restaurants can cook up meaningful connections with customers by being present in the intent-rich moments when people turn to the web. It's an age-old question: "Where should we go for dinner?" With seemingly endless dining options all over Australia, the answer usually isn't so simple. Whether they're looking to grab a quick bite or plan a special get-together, Aussies turn to their trusty smartphones to find new restaurants, read reviews, check maps, and finally make their choices. 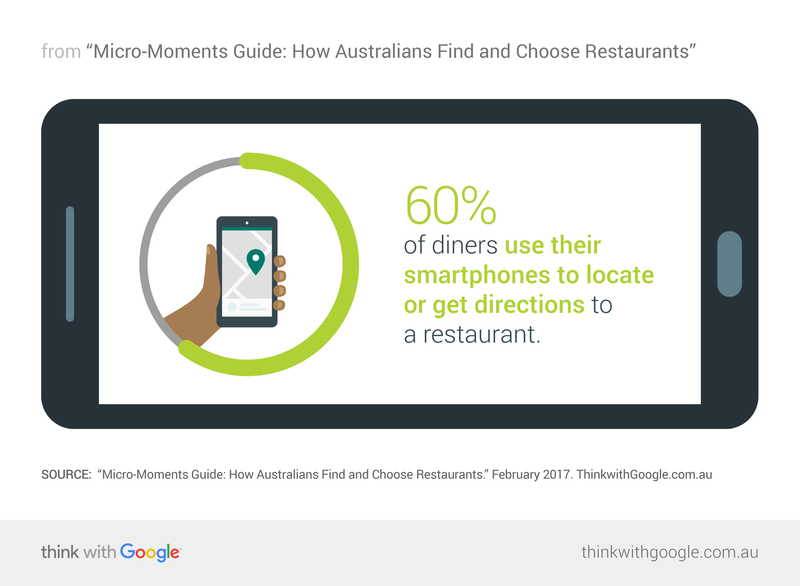 Using qualitative and quantitative data, we took a look at how Australians decide where to eat, particularly diving into the role of mobile in key micro-moments along the way. 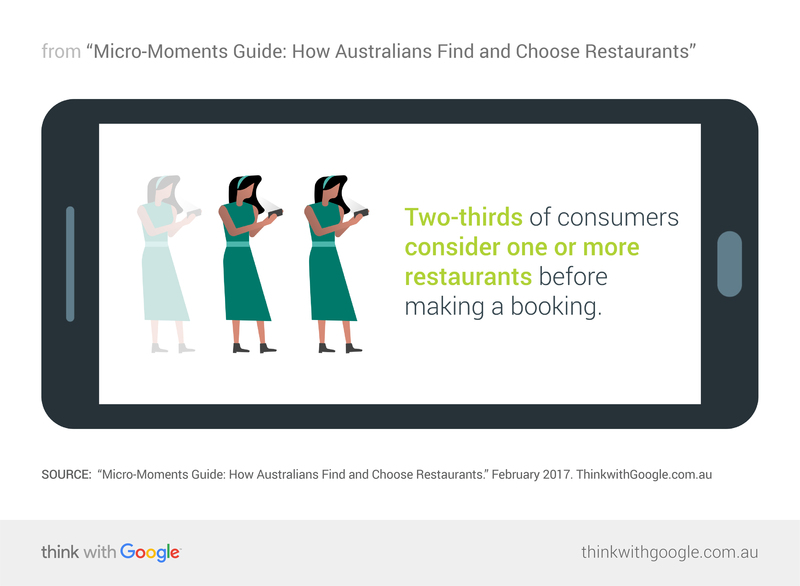 In this edition of our micro-moments guide, we have new research and takeaways for restaurateurs looking to win over hungry Australians. How people use their smartphones, however, can change based on why they're looking for a restaurant. Let's take two Melbourne residents, Michael and Anna, as examples. Michael wants to grab a quick lunch and he's tired of his regular standbys; Anna is planning a celebration for her best friend's birthday in two weeks and wants to find somewhere special. Michael might start by searching for broad terms such as "indian food melbourne" or "lunch specials near me," keeping an eye out for spots that have high ratings. Local convenience is key as "near me" searches within the category of food and drink have doubled since 2015. Anna has more time to plan ahead, so she gets a few ideas by searching for terms like "waterfront restaurants in melbourne" and "best restaurants for large groups." For either kind of diner, discovery is the name of the game at this point in the process. Whether they're looking for the newest, hottest place in town or just need a nudge to try a place they've walked by a hundred times, they're on the hunt for ideas. Show up on mobile to be considered: A robust mobile presence, including showing up for wide range of keywords, will help you reach people looking for ideas. If you own an Indian restaurant, for example, don't just show up for the term "indian restaurants," but also be there when people search for things like "sydney waterfront restaurants," "restaurants with vegetarian menu," or "restaurants with outdoor seating." Claiming your business online is a piece of cake: Create a local online business listing to let people know when you're open, where you're located, and how to get to you. Anna, on the other hand, wants to pick a place that all her friends will love (a tall order). After narrowing her search down to a few waterfront restaurants, she carefully compares menus for prices and options, scours reviews from past diners about service and food, and peruses pictures throughout the week to get a feel for each restaurant—all from her mobile device. Highlight the full dining experience: Give diners the details they crave by featuring high-quality pictures of your food and restaurant's interior on your business listing. Turn on reviews: Featuring reviews and comments is a great way to inspire confidence in potential patrons. Feature mobile-friendly menus: After testing your site to make sure it runs smoothly for mobile users, include an easy-to-read menu with prices to inform potential customers. Show up in local listings: Make it easy for people to find your business by showing up in "near me" searches, keeping your business listing address accurate and updated, and setting up location extensions. Like everything else in their path to discovering a restaurant, mobile is diners' preferred way to make a reservation. Anna has the time to make online reservations in advance, so she checks for availability on her friend's birthday. She doesn't get around to finalising her plans until Saturday morning (when the restaurant is closed), but the restaurant's website has an online booking tool that allows her to secure a table easily. Keep the booking process simple and seamless: Have an online reservation booking tool on your website to make it easy for diners to secure a table, even when you're closed. This also allows people to see what other days or times are available in case their plans change. Make it easy for customers to call: For urgent reservations or last-minute meal planners, calling is still the best way to enquire about table availability. Click-to-call buttons allow diners to get in touch with your business easily at a moment's notice. 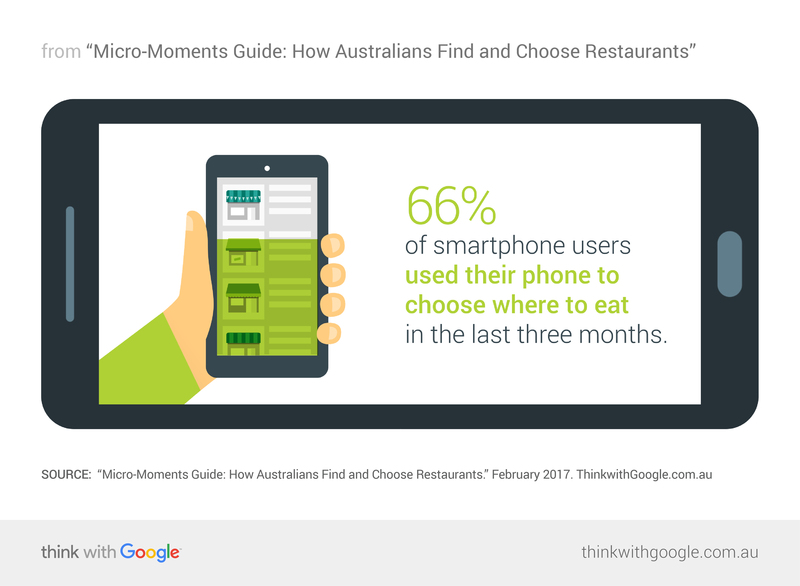 Smartphones are hungry Aussies' best friends in the moments they're looking for a place to eat. When you meet diners on mobile with a smorgasbord of relevant details, pictures, and reviews and make it easy for them to secure a table, you'll quickly move people from thoughts of "ugh, I don’t want to cook" to "I'm ready to book!" Methodology Google partnered with TNS Australia in October 2016 to conduct qualitative research with n=30 18–54-year-olds across Australia, around how consumers research, shop for, and purchase a range of categories. This research supports a variety of other quantitative studies (sourced below) in order to gain a deep understanding of category specific micro-moments. 1 Google/Galaxy, "Consumers in the Micro-Moment," June 2015, Australia. 2 Google/TNS, "The Consumer Barometer Survey," 2014/15, Base: Internet users (accessing via smartphone) answering based on recent purchases in select categories who became aware of products purchased during research. 3 Google/Galaxy, "Consumers in the Micro-Moment," June 2015, Australia, n=390 smartphone shoppers. 4 Google/Ipsos, "Location Information Study," May 2014, Australia, Base n=2,417.